To become the daughter-in-law of India’s Pataudi family after getting married to superstar Saif Ali Khan, Kareena Kapoor has decided to change her religion into Islam. 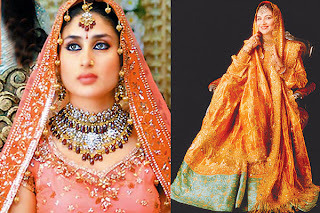 Though Bebo will reportedly adorn mother-in-law Sharmila Tagore's bridal finery - a heavily embellished shararakurti with dupatta - she might not acquire a Muslim name or identity. 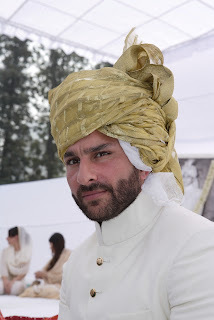 Hot Bollywood Bebo, Kareena Kapoor and the son of ninth Nawab of Pataudi, Saif Ali Khan will tie the knot in a much anticipated wedding ceremony at Saif Ali Khan’s ancestral home Pataudi Palace on 17 October, 2012, to be attended by family members only. The invitations for the wedding have already been sent out. Kareena has always maintained she follows all religions and has been visiting a church ever since she was a child since her mother Babita's mom was Catholic. She had earlier hinted that she would have a Hindu marriage. In the earlier inter-faith marriages of the Pataudi family, women converted to Islam for the nikaah. Saif's parents', Sharmila and late cricketer Mansoor Ali Khan Pataudi, had a traditional nikaah ceremony in 1969. Sharmila, a Bengali from Rabindranath Tagore's family, converted to Islam and took the name of Ayesha Begum. 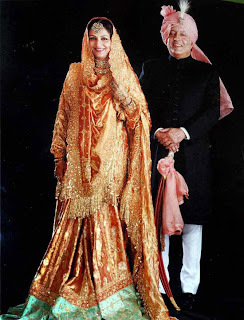 Similarly, Saif' s first marriage to actress Amrita Singh in 1991 was also a Muslim wedding. Amrita, who followed the Sikh religion since childhood, was converted to Islam by a maulavi for the secret wedding. She also adopted a Muslim name. Since marriage is the culmination of any relationship, people are always rushing us into it. We definitely didn’t get into a relationship without thinking of the future. But apart from just signing on a piece of paper and having children, I don’t think we are missing out on marriage at the moment. So neither is Kareena after me, nor am I after her to get married. Is it because it will be hard for Kareena to do the balancing act? She is the kind of woman who can give 100 per cent to her career and 100 per cent to her home. Not many actresses have dedication like her. Her level of dedication can only be equated to that of Aamir and Shah Rukh. I want her to fly and soar to the zenith of success. I am not as big a star as she is. I don’t even know if I will ever reach that level. A relationship is not about controlling a person. It’s about being there for each other and not being insecure. What will we talk about at the end of the day if we are not working? I am. Kareena is the best thing to have happened to me. I already feel married. It just needs to be legalised on paper and that will happen when the time is right. 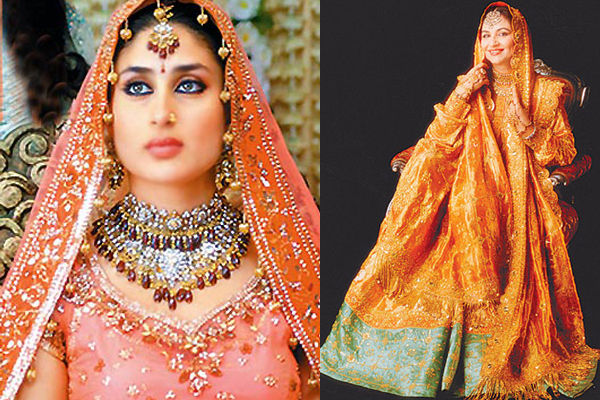 Will Kareena be Begum Pataudi ? She’s a queen in her own right and doesn't need me to make her one. But I see some people in Pataudi calling her Choti Begum. Do you ever feel that too much is being said and written with regards to your relationship? Yes, I do feel that. When we started dating there was too much speculation about our relationship, so at the time it was fine to talk about our commitment to each other. Now it’s time for our work to do the talking.